Oy vey. Tomorrow is the big day: cold morning photo shoot with girls in tweed skirts, scarves, chunky cable knit sweaters and cardigans ... I'm really looking forward to capturing the early morning air, when you can see breath, but not looking forward to losing all feeling in my extremities. one of my favourite outfits of yours so far! Nice ruffled blouse! Pretty much all I've been wearing lately are my various ruffled blouses. That subtle stripe is very cool-- all of mine are plain white. I really love those pants, and the ruffled blouse with fur vest is such an unexpected but pleasant combination. Lovely! Good luck staying warm!! oooh i just love those trousers. The buttons on the front are amazing! lovet pants & top!! and hair is cute!! Love this shirt! And I'm so excited to see the photos from this shoot. Those are ALL my favorite things to wear and early morning in the cold is the best time to shoot. I love how you can play with the breath in the cold air. Good luck! I want this outfit! There is nothing about it I don't love. 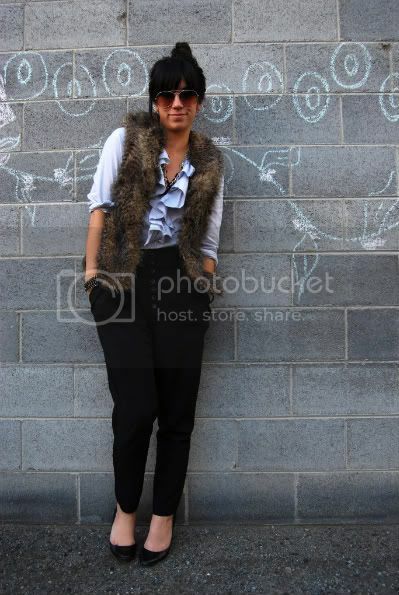 Absolutely love your pants and vest! Stunning. You look so fab. I LOVE that little furry waistcoat! Faux fur is my current obsession. Gorgeous! Oh man, the photo shoot I did at the beginning of November was painfully cold-- 22 degrees! I really did lose feeling in my fingers. Yours sound like it will be lovely. Good luck! I love that fur vest, it is so unique. I doubt I could pull it off so well. i am so inspired by your style lately. to me this is a really unexpected, and completely cool and quirky look. i love it! fur and ruffles.. YES YES YES!! Love it so much, such a great outfit.